Wireless services provider in the Philippines, Smart Communications Inc. (Smart) officially announced today, August 14, 2014 a major leap in mobile technology as Long-Term Evolution (LTE) - Advanced refer to as '5G' now runs on its network. But, what exactly is it? Let’s take a closer look on some facts and quick review of this data evolution. Recently, Smart has rolled out LTE-Advanced (LTE-A) at Smart Jump Center in Mandaluyong City to showcase the next phase of data network technology. According to standards, LTE-A has a theoretical peak rate of 1Gbps but due to real world conditions, actual download speed varies from 100 to 300 Mbps. It is expected to be at least five times as fast compared to existing LTE of Smart with commercial throughput of 42Mbps maximum through dongle and peak rate of about 75Mbps during other test scenario. 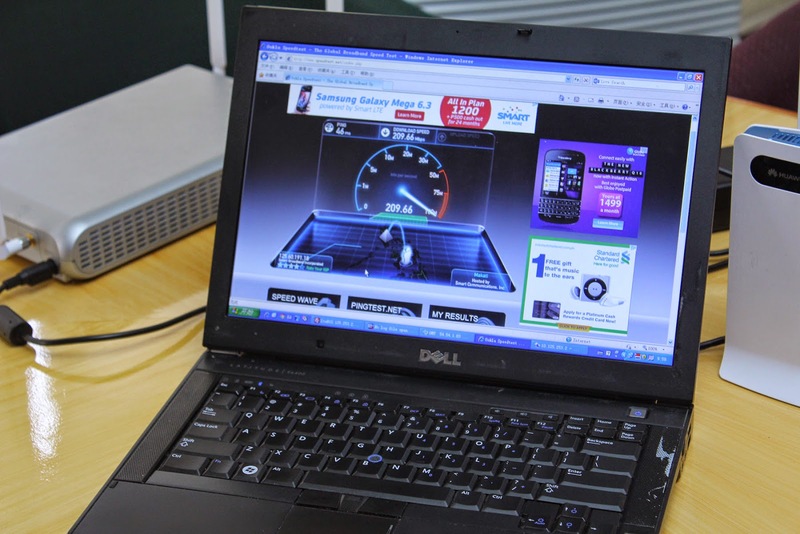 Smart boasts its capability to deliver 'next-level' speed as 209.66 Mbps were recorded during their test. How it was achieved? LTE-A goal is to provide higher data capacity, enhanced user experience in a cost efficient way and completely fulfill the requirements set by ITU for IMT Advanced, also referred to as 4G. According to 3GPP, a group of telecommunications associaltions that worked for the success of LTE, the main new functionalities introduced in LTE-A are Carrier Aggregation (CA), enhanced use of multi-antenna techniques and support for Relay Nodes (RN). Carrier Aggregation (CA) enables greater speeds because it allows users to download data from multiple sources at the same time. CA uses maximum of five component carrier frequencies (bandwidth). MIMO, stands for Multiple Input Multiple Output, is used to increase the overall bitrate through transmission of two (or more) different data streams on two (or more) different antennas - using the same resources in both frequency and time, separated only through use of different reference signals - to be received by two or more antennas. The Relay Nodes are low power base stations that will provide enhanced coverage and capacity at cell edges. With the launch in the Philippines of '5G', Smart joins major carriers around the world with an LTE-A network, along with leading mobile operators in South Korea, United States, Singapore, Australia, and Hong Kong. “Even as our 3G and 4G networks continue to be unrivaled, Smart becomes the first operator to leap into the future and put the Philippines at par with the world’s most advanced countries in terms of mobile communications technology,” Orlando B. Vea, founder and Chief Wireless Advisor of Smart said. According to Smart, a 10MB file takes less than a second to download, YouTube videos no longer have to buffer, and video calls are almost lag-free with the use of LTE-A. Smart has started testing LTE-A across the country in August last year, delivering results of more than 100Mbps in Makati City, in Boracay, and in Davao City during the Kadayawan festival. After the LTE-A announcement on Thursday, netizens immediately reacted on the '5G' technology offer of Smart with some are confused if '5G' is real or it's just the true '4G'. When the 4G LTE was first launched by Smart in the country two years ago, its rival Globe Telecom has announced that LTE is not the first 4G technology but other services such as WIMAX and HSPA+ are also included in the portfolio. In a strict sense, it is just a commercial label which makes things complicated. Only 'LTE' is true 4G and the roll-out of LTE-A is an improvement of the current worlwide accepted speed. Based from observations, some sources suggest that a new generation of 5G standards may be introduced approximately in the early 2020s. As of this writing, there is still a large extent of debate on what 5G is exactly about. And now that we're moving to LTE-A, users won’t automatically be able to enjoy LTE Advanced as you’ll need a new device with an LTE-A chip in it. Samsung is among the mobile manufacturers with devices capable of running LTE - A, the Samsung Galaxy S4 LTE-A and the for release Samsung Galaxy S4 LTE-A.